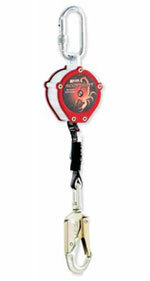 The quick activating Scorpion™ fall arrestor, strikes fast, arresting a fall in centimetres. The lightweight and compact design of the Scorpion™ fall arrestor provides workers with an affordable alternative to standard energy absorbing lanyards. In a head to toe comparison, the Scorpion fall arrestor requires less fall clearance, offers greater mobility and prevents tripping hazards. The Scorpion fall arrestor strikes fast, and limits free falls to centimetres. Fully compliant with AS/NZS 1891.3, it is strong, lightweight and made from ultra tough durable components. The Scorpion fall arrestor is a compact palm size unit for easy positioning and has 2.7 metres of webbing working capacity. A visual load indicator shows when the unit must be removed from service. It is constructed with corrosion resistant internal parts and has a stainless steel/aluminium body encased in a high impact polymer cover. The MightyLite fall arrestor range offers comprehensive choices to suit many applications. Swivel top and bottom attachments. 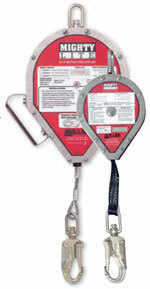 Easy to carry and install, ideal for hard to mount locations. 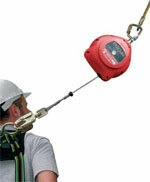 Suited to construction, industrial access and warehousing. 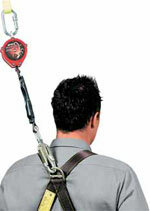 A lightweight compact type 2 fall arrestor with retractable webbing, limits free falls and offers greater mobility. 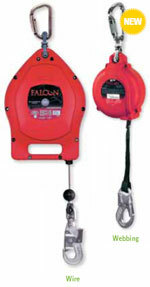 Visual load indicating hook shows when unit has takena fall. 2.7m of webbing working capacity. Stainless steel and aluminium body with high impact polymer cover. Quick activating breaking system limiting free fall to a minimum. MiniLite fall arrestor is a type 2 fall arrestor with a quick activating braking system limiting a free fall to millimetres. Visual load indicator, shows the unit has been involved in a fall. High impact protective outer cover. 3m of retractable webbing working capacity. Unique side pay out design reduces entry guide and cable wear. "No annual factory re-certification" lowers costs and downtime. Load indicating hook identifies unit removal from service. Lightweight smooth composite housing increases durability. Galvanised wire, webbing or fully stainless steel unit options. Designed with stainless steel cable, the Miller Black Rhino fall arrestor was developed to endure the daily rigors of harsh environments such as concrete construction, welding, steel erection, food processing and warehousing applications. The 2.7 metres of working capacity offers greater mobility and arrests a fall within centimetres, minimising the risk to the employee in the event of a fall. 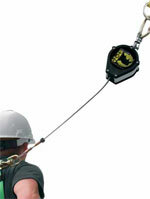 A shorter arrest distance usually positions the user where they can be quickly rescued. 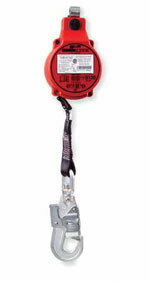 This lightweight unit also features an integral load indicator which shows when the unit must be removed from service. It has corrosion resistant stainless steel and aluminium components for strength you can depend on. Quick activating high strength stainless steel braking system. Integral load indicator shows if a fall has been taken. Integral internal shock absorber limits fall forces to under 4kN. Full stainless steel option is available. Also available with triple acting karabiner terminations (TAK).